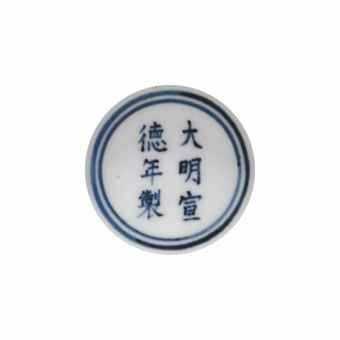 Notes: This superb bowl is a classic example of the fine blue and white porcelains made during the reign of the Xuande emperor. 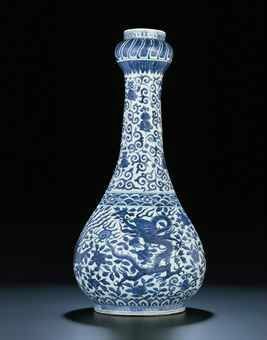 The porcelains of this period have always been especially admired by Chinese connoisseurs, to the extent that three hundred years later, when the Qianlong Emperor wished to compliment contemporary porcelains, he compared them to the porcelains of the Xuande and Chenghua (1465-87) reigns. The Xuande Emperor was a very enthusiastic patron of porcelain production, and the potters working at the imperial kilns were required to make an astonishingly wide range of vessel shapes, ranging from huge jars to tiny flower vases for the cages of song birds. Amongst the varied bowl forms of the period, the graceful conical shape of this finely potted bowl is one of the most elegant. 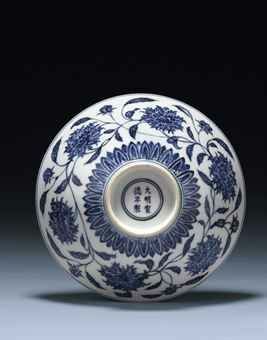 It is especially the blue and white porcelains of the Xuande reign that are considered masterpieces of the potters' art. The underglaze blue designs of the period are admired both for the colour of the blue and for the vitality of the painting. 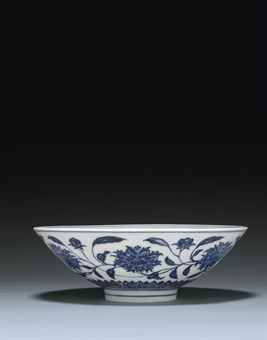 While most later blue and white painting is done using a fine brush to paint outlines and a wide brush to apply washes of colour within them, Xuande porcelains like this bowl have very few outlines and are painted with a skilfully wielded, medium width, brush. This gives the designs greater spontaneity and fluency, which can be particularly appreciated in the painting of the floral scrolls on this bowl. 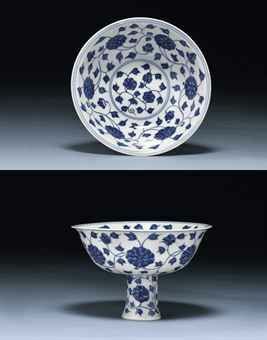 Compare the similar bowl illustrated by J. Ayers, Far Eastern Ceramics in the Victoria and Albert Museum, London, 1980, no. 147; another in the Catalogue of the Special Exhibition of Selected Hsuan-te Imperial Porcelains of the Ming Dynasty, National Palace Museum, Taipei, 1998, pp. 176-177, no. 61; and one in the collection of the Shanghai Museum illustrated by Wang Qingzheng in Underglaze Blue and Red, Hong Kong, 1987, p. 68, no. 55. A similar example in the Falk Collection was sold at Christie's New York, 16 October 2001, lot 135; and another sold at Christie's New York on 29 March 2006, lot 422.